Audi prevailed in qualifying for round 2 of the FIA World Endurance Championship (WEC): At Spa, the three Audi R18 e-tron quattro cars secured the three front grid positions and thus have good prerequisites for the race that starts at 14:30 on Saturday. 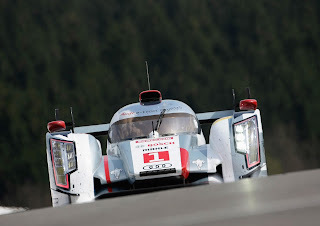 In qualifying at Spa-Francorchamps, Audi managed the maximum – last year’s World Champion is at the front of the grid with all three hybrid sports cars. Marcel Fässler (CH) and André Lotterer (D) on their four best laps achieved an average of 1m 59.961s. In the number 1 Audi R18 e-tron quattro they are competing together with Benoît Tréluyer (F) and were the only driver squad to break the two-minute mark. An impressive performance was achieved by Lucas di Grassi (BR) and Marc Gené (E). With Oliver Jarvis (GB) they share the number 3 hybrid sports car which has been aerodynamically optimized for the upcoming run at Le Mans. But even on the track in the Ardennes that is less suitable for this body version, they qualified for the front row by posting a time of 2m 00.236, missing the best time by only 0.274s. On his first lap, Lucas di Grassi even set the fastest time of the day at 1m 58.934s. Third place is shared by the three leaders of the standings. Tom Kristensen (DK) and Allan McNish (GB) on average posted a lap time of 2m 00.610s. They are contesting the race together with Loïc Duval (F). As Audi’s best immediate rival, the number 7 Toyota in position four missed the best time by 0.986s. The 6-hour race at Spa starts at 14:30 on Saturday. The second of eight rounds of the season can be watched on the internet by live streaming at www.audi-liveracing.com and at www.fiawec.com. Eurosport is airing live reports from Spa. In Germany, the channel will cover the final phase of the race from 19.30 to 20.30.